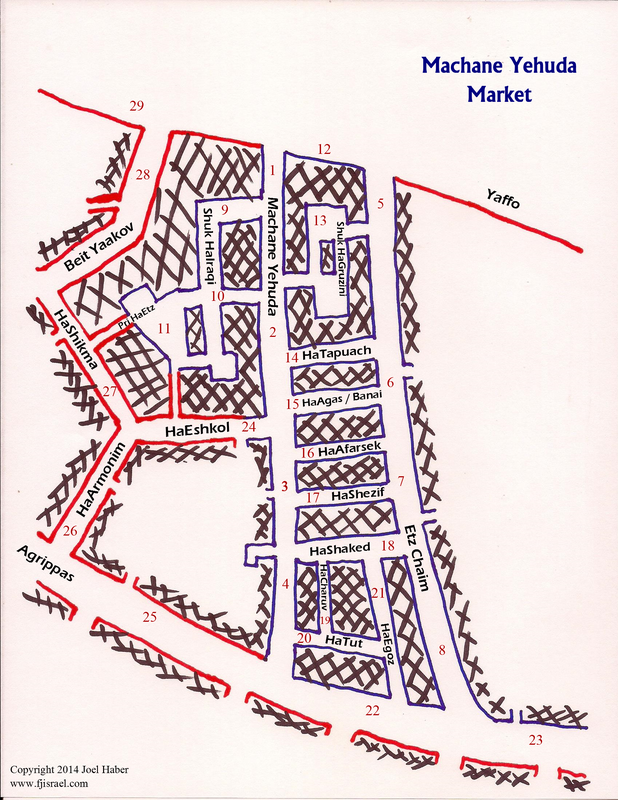 This is a map of Machane Yehuda Market and a bit of the surrounding area. The area in blue is the actual shuk, and I have listed every single store or stand in the market. Red areas are near the shuk, and I have only listed selected highlights. The red numbers correspond to listings below the map in which I list the stores in each section. First you will find a listing of highlights by type of store, then the full list of all stores by section number. CLICK HERE to download a printable 4-page map with store info. – “Cohen Chamutzim” pickles, olives, etc. – “Birkat Yehonatan” kugel, smoked fish, etc. – “Ibgi” cheese, smoked fish, etc. – “Olam HaTavlinim v’HaKafeh” spices, coffee, etc.